Brian Bokowy, Vice President Sales & Mktg. Vantage Commercial Water Systems offers a complete line of pool and spa chemicals and chemical feeders for aquatic professionals. The ACF Series of Calcium Hypochlorite Tablet Feeders and VPF-20 Poly-A Tablet Feeder are simple and reliable systems designed with aquatic facility manager input to reliably sanitize and clarify any size aquatic facility. 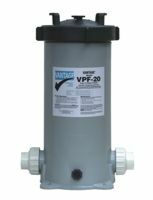 The Vantage VPF-20 feeder is a simple and effective way to deliver Vantage Poly-A clarifier tablets. Vantage Poly-A is a powerful tablet clarifier that aids in the coagulation of inorganic and organic compounds that can create dull and cloudy water conditions. Use Poly-A tablets to remove small particles and other compounds to maintain clear water.